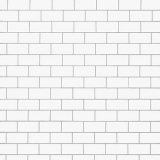 The Wall is ranked 3rd best out of 31 albums by Pink Floyd on BestEverAlbums.com. Members who like this album also like: Wish You Were Here by Pink Floyd, Animals by Pink Floyd and London Calling by The Clash. Related links: top tracks by Pink Floydtop tracks of the 1970s, top tracks of 1979. Showing latest 5 ratings for this album. | Show all 2,816 ratings for this album. Weakest track: "The Show Must Go On"
One of the coolest and unique albums ive heard. Gotta love rock operas! As soon as Pink Floyd started making album after album about how difficult life is for a very successful and fortunate musician, their music was roughly equally as dull. It will be different if the music on this album brought the lyrics to life, but it doesn't. Except on the great Run like Hell and Another Brick in the Wall Part 2. Nothing else on this album even comes close to any of their albums up through Dark Side of the Moon. That album would have been great even if it didn't have any lyrics. Perfect soundtrack for a kid just learning to figure things out. Will always be an all time great. Marco da música progressiva e da banda. E ainda hoje, no Brasil, o conceito não foi compreendido. There are only two 'concept' albums that really work, this one and The Lamb Lies Down on Broadway. The only way to listen to this album is to do it in one sitting. This is the Masterpiece of Pink Floyd, Surely. And a Masterpiece of Music of all times. It's perfect conceptually, musically, so hard to superate. The twenty´s century Masterpiece.